A CSV file is a delimited file for tabular data and plain text that uses a comma to separate field values. 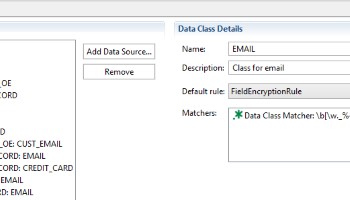 Files in CSV format can be imported and exported from programs that can store data in tables. 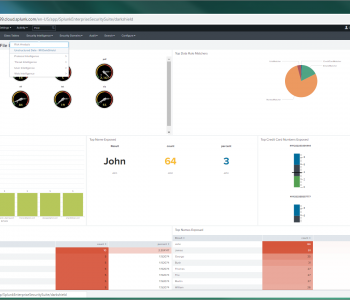 IRI Workbench is the graphical user interface (GUI) and integrated development environment (IDE) for all IRI data management and protection software products, and the Voracity platform which includes them. 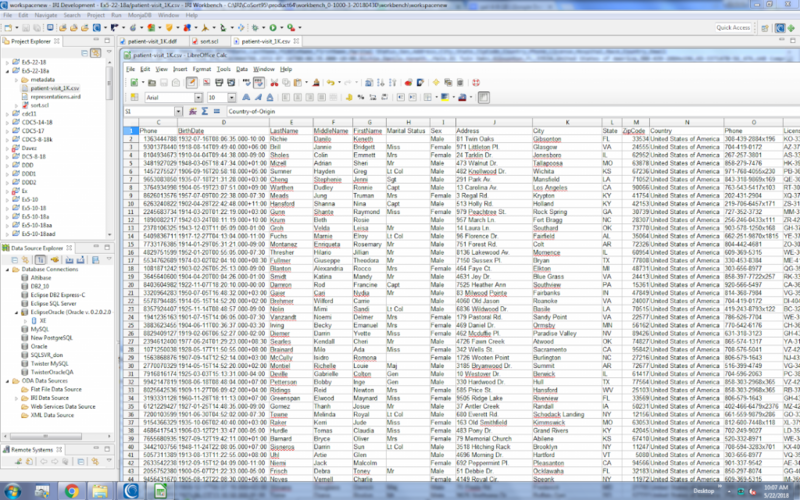 My example uses a simple sort and PII mask of data in a CSV file. 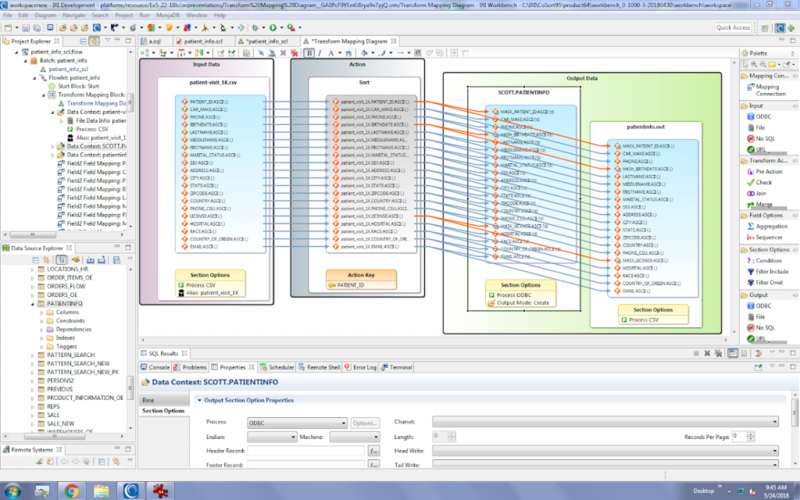 It sends the output to another CSV file and an Oracle database table. 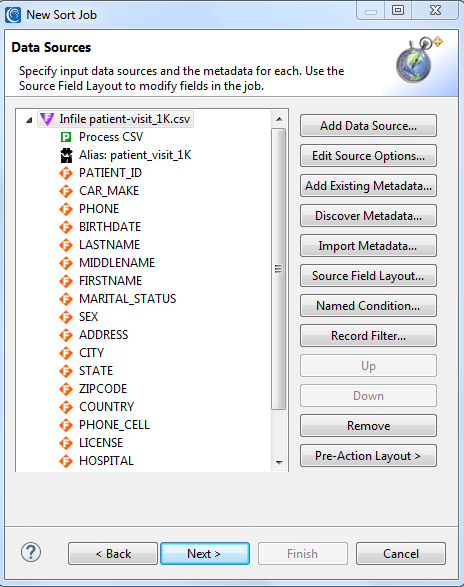 I first locate my data source, a file called patient-visit_1K.csv, which contains a form of PII known as PHI (protected health information). 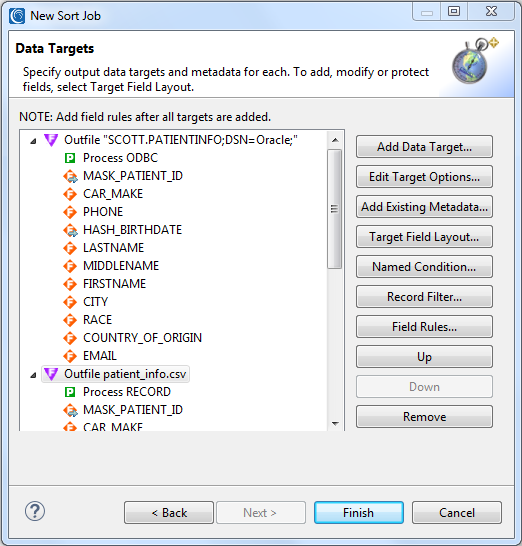 Note that IRI has several data discovery tools, including a flat-file profilers and “dark data” wizard to find PII in CSVs. The PHI in that file should be masked according to HIPAA data privacy rules, but I’m only showing a few techniques. The figure below shows the file’s contents, including FirstName, LastName, BirthDate, Country, Address, City, State, Phone, and License. 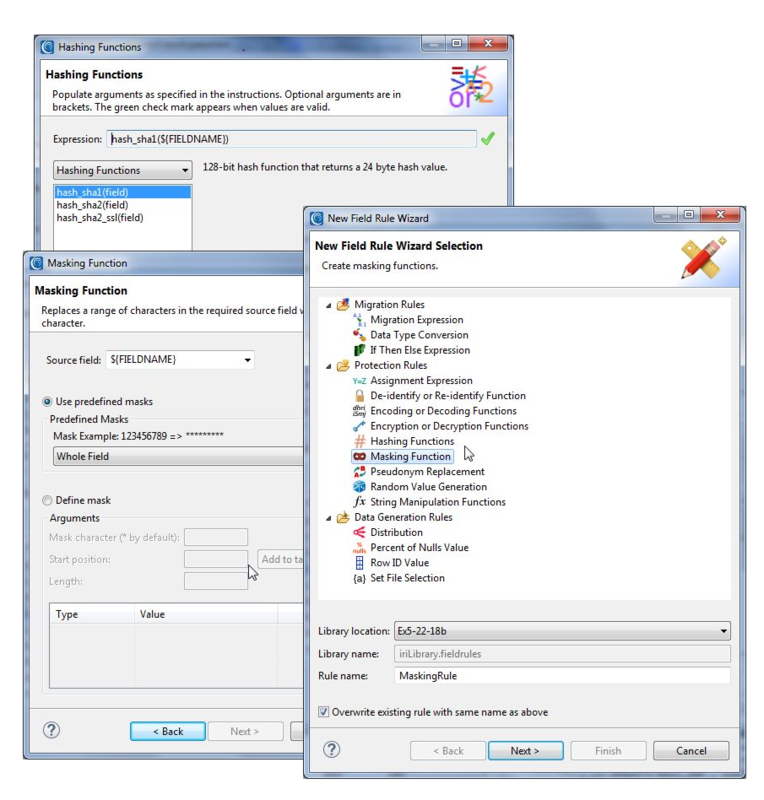 As mentioned, IRI Workbench includes many fit-for-purpose wizards that design discrete tasks (. *cl scripts), or batch jobs (.flow and .bat/.sh files) which run on the command line, through Workbench, your programs, etc. 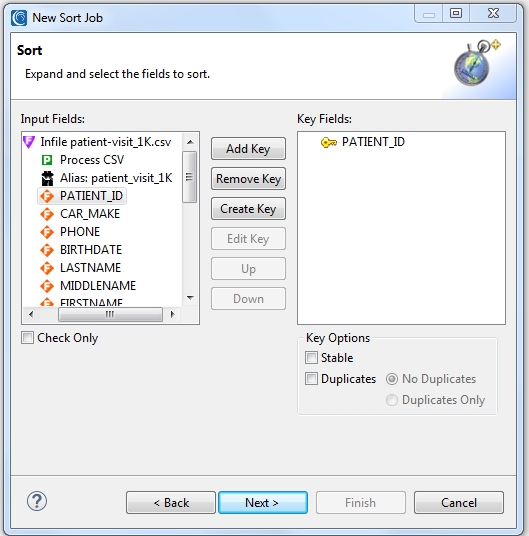 I chose a simple sort job wizard because even its single .scl script result can specify several functions and targets. Next I browse to specify the location (path) and name of my input file, plus its field layouts in IRI data definition format (DDF), which all SortCL-compatible programs require. 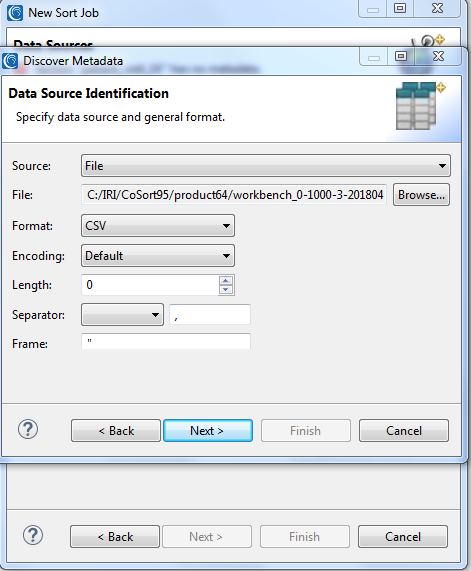 This metadata can be specified directly in the job script, or stand alone in a reusable, shareable DDF file that other IRI programs can use. 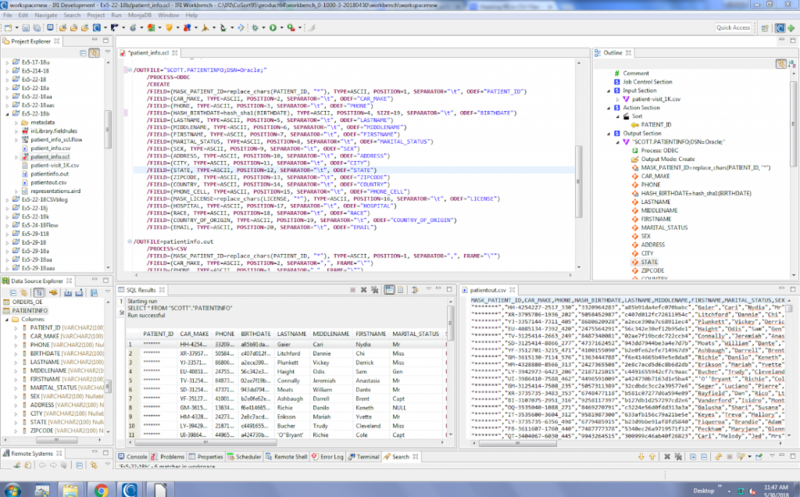 It is for this reason that the wizards ask me to use an existing, or auto-create new, DDF metadata for my input file. Because the DDF did not yet exist, I chose the Discover Metadata … option, where a sub-wizard parsed my .CSV file headers into DDF layouts. I then chose to put that layout detail directly into my job script as input specifications, rather than save and refer to them from an external DDF file. The images below show where I apply hashing and redaction functions for my selected fields. 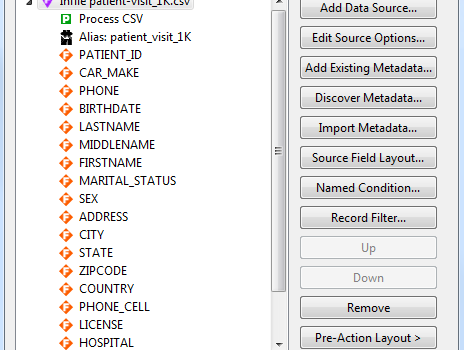 I chose basic string masking to redact the patient_id and license values, and a hash function for the birthdate. Note that IRI also supports both mathematical expressions and random date blurs to shift ISO-formatted dates by a given number of days. 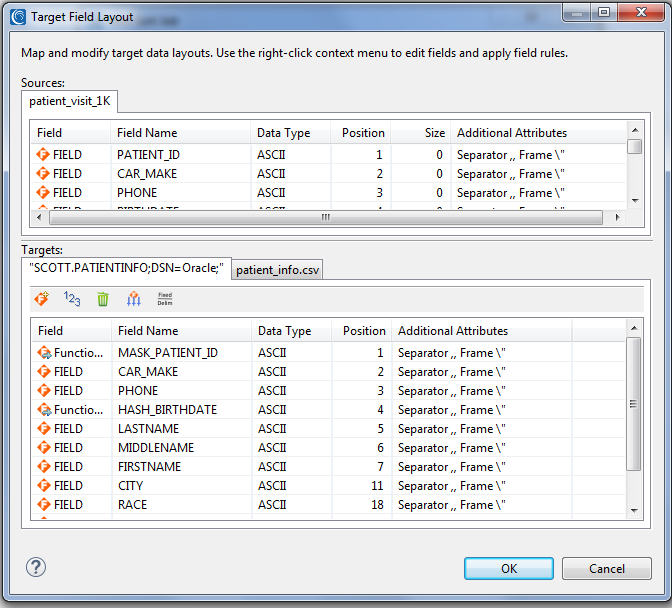 See this article for advice on selecting the right data masking function for any given field. Now that I have designed the job, I click finish to have the wizard save the job in script form, so I can review, modify, share, and run it as needed. 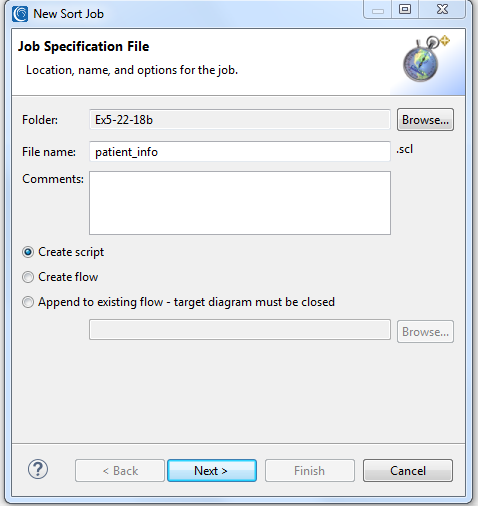 The job script generated by the wizard is automatically displayed in the GUI for review, modification, and execution. That script gets parsed and run in a command-line FieldShield executable, or a SortCL executable licensed for CoSort/Voracity use. 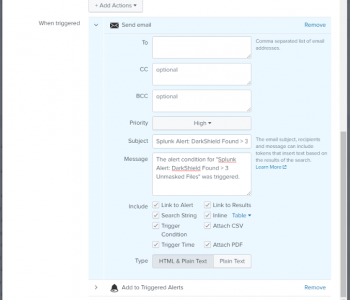 I can deploy it from ad hoc or through its task scheduler, or from the command line or any external batch or scheduling program. 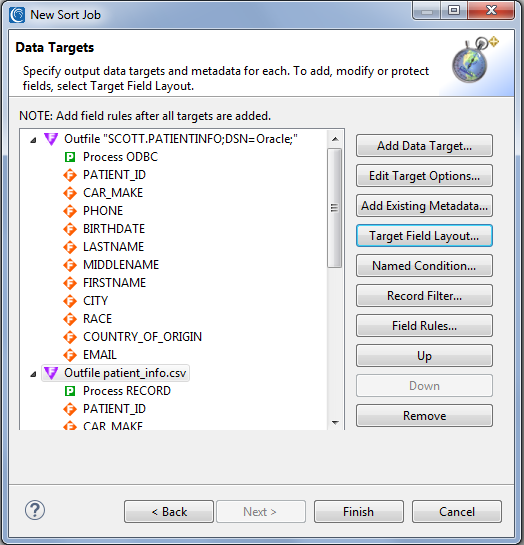 The orange connections denote those target files that have been derived or transformed; in this case, a data masking function. I can also create modify my job parameters from these diagrams as well, and save the changes to overwrite my job script. If you have any questions about CSV or other flat file manipulation or masking, comment below or contact your IRI representative.